What is supposed to happen here? I’ve tried to share all sorts of plain text to Dynalist but all that happens is the app opens, sometimes with a document open, sometimes without. My original thought was to try creating quick notes in Google Keep and share those to Dynalist when I have time, but that doesn’t work either. Have you set up a an inbox location already? In other words, if Dynalist is already open in the background when you share, does it work? Ahh, it is, but there is a little more to it. I thought being able to use Google Keep to quickly capture information [from a widget on the home screen] and then share it to Dynalist later would have been a good combination. It seems that sharing a note from Keep loads a 2nd instance of Dynalist (as shown in the screenshot). Because that kept happening, I was killing both instances and retrying, which leads into that bug that was already reported. Sorry, didn’t see the original posting. That’s weird, I don’t how exactly how Google Keep handles this. 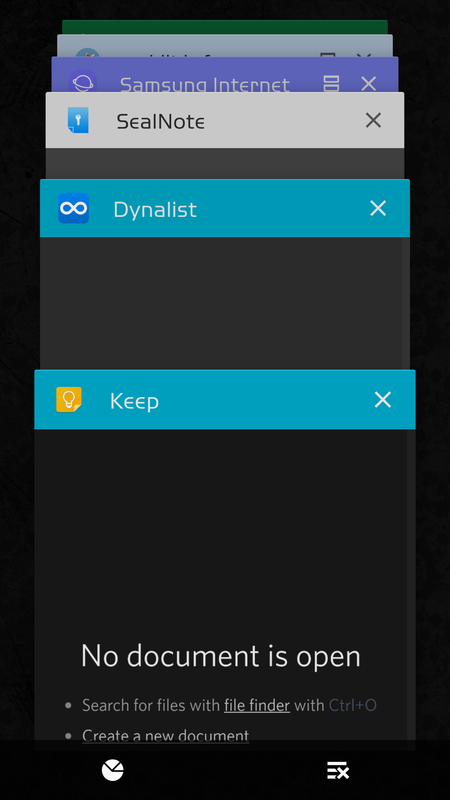 The app title seems to say "Google Keep’, but it’s Dynalist’s UI inside. I wonder how you got there – was there a typical sharing screen popping up? Or did you enter something in the widget, select that, and share to Dynalist? It isn’t easy to capture information quickly into to Dynalist on mobile, so the thought was to use Google Keep as more of an Inbox and share notes to Dynalist from there. The widget has a button to single tap and start typing. Android’s ‘Note to Self’ option would work well too. Either way, from inside the Google Keep app, you can ‘Share’ notes individually to Dynalist (or the clipboard or other apps as you’d expect). There are other note apps where this combination works well. But Google Keep would have been a great 1st choice since it also has a web option. In that way, if I wasn’t strictly on mobile, I could load both in seperate browser tabs and move my information from Keep to Dynalist there also. Just to let you know there’s an app about to be released Dynawrite (not mine) that I think can replace the way you are using Google Keep. Is there any info about it on the web? It was the Japanese developers I mentioned to you before. They’d also produced HandyFlowy and MemoFlowy. This would be a Dynalist equivalent. Did you hear about it on Twitter? No, I contacted them and suggested the idea. I’ve since been testing it. @Erica Hello, on Android is Share a pro only feature? Because it doesn’t work for me, at all. All it does is, open the app for me. I’ve checked my inbox folder, no new entries recorded there or anywhere. I don’t have the 2 instances thing the gentleman above seem to have. I’ve tried sharing from a few applications. I’ve tried sharing when dynalist was in memory i.e. opened in the background and otherwise. Android device runs 7.1.1, if there are any log files that can help with troubleshooting this, I’d be happy to provide them. It doesn’t work if the Dynalist app is not in active memory. If you do it a second time after activating it, it should work. They are working to fix this, I believe. No it’s not a Pro feature. What Dynalist version are you using? Is it the latest (1.1.18)? Lastly, do you at least see the “Dynalist” option in the sharesheet? He seems to suggest that it doesn’t work even with Dynalist open in background, so it might be something different. And yes, the issue you’re referring to will be fixed in 1.1.19. Thanks for replying. Yes, I am using the latest version (1.1.18). Yes, I do see Dynalist in sharesheet. @Kevin_Murray for me it doesn’t work either way. It just opens the app for me. Do you see any message that appears at the bottom of the screen?